Sitting in the woods the other day pondering the current drive to get learning outside, I suddenly realised that nowhere on my website have I mentioned that all our courses are endorsed by the Institute for Outdoor Learning. If you haven’t visited their website, do. It highlights the vast range of outdoor activities happening around the country, enabling people of all ages to develop new skills. They are pioneers in their field and integral in leading the drive to take learning outside. If you are interested in reading the latest research into the benefits of Outdoor Learning check out their blog. As you’d imagine, I love the one about mud. Another urgent addition to my website must be that Cambridge Forest Schools are an associate trainer with Cambium Sustainable who are an ethical training company based in South Wales. My decision to become a Level 4 trainer with Cambium Sustainable was influenced by the unique suite of Forest School and Outdoor Learning training courses I am now qualified to deliver, giving settings the choice as to how they introduce Outdoor Learning to their children. 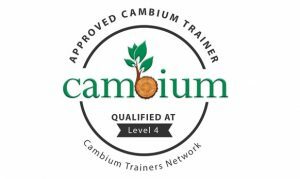 As an associate trainer, I am part of the Cambium trainers network and we work together to ensure the high quality of our training courses is maintained. Not only that, but I access regular Professional Development including a recent field-trip to Eco Schools and an Outdoor Nursery in Finland. (more about that later). A recent new development is that Cambridge Forest Schools now offer Outdoor Learning Practitioner trainees the unique opportunity to add an accredited Practical Skills unit to their course. This enables practitioners to provide curriculum based learning through practical skills such as cooking on the fire. Roman pancakes anyone? Exciting. So ironically, my next immediate step is to sit in front of a screen to tackle the technical challenge of adding logos to my website whilst trying to resist the temptation to go outside.